Everybody loves timeless, traditional Christmas music, but...wait a minute, that's not even close to true. But it will be once you crunken up your holiday with this ridiculously awesome playlist of Christmas songs chosen by eight local DJs: Axel Lowe: "You're A Mean One Mr. Grinch" by Hip Heavy Lip This early-'90s Atlanta band puts a live rock performance feel on the classic cartoon anthem; the 99X Morning Show host laments its absence in Jim Carrey's The Grinch, saying "C'mon Ron Howard, you could have made these guys famous" -- hey, if he did it for Clint, he can do it for anybody! 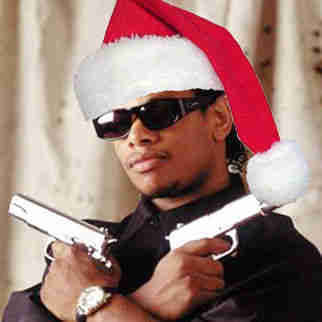 Wally Sparks: "Merry Muthaphukkin Xmas" by Eazy-E Sparks picked this hilariously vulgar ode to X-mas by the Compton O.G. because it features Dolemite on the intro, and has "a cursing child, and a boisterous woman pleading for some good loving"...oh, just shut up, Ruth Bader Ginsburg. Nobody wants to bang you!! DJ Princess Cut: " What You Want For Christmas" by Quad City DJs, K-Nock & The 69 Boyz The-Dream and Goodie Mob's tour DJ dances whenever she hears this booty-shake version of "12 Days of Christmas", and says it relates to more people by "totally flipping the original", which just also happens to be a useful skill if you work at Krystal. 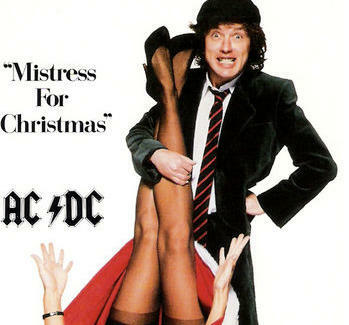 Erin Watson: "Mistress for Christmas" by AC/DC "I was once known as Mistress Erin (in Columbus); my listeners loved picturing me in leather with whips and chains. I teased them with this during the holidays :)", says Rock 100.5's "Radio Fox", a name nobody's called Samantha since "Touch Me". DJ Scream: "It's Christmas" by Gorilla Zoe A happy, bouncy number from one of ATL's own, this cut is perfect for the make-it-rain-in-the-mall baller according to mixtape master Scream, who adds that it's "definitely a sleeper", just like Priest Holmes in your fantasy league -- playoffs pickup, son!